Etude House sometimes has this deal of buy 1 get 1 free and that was how I ended up with Play 101 Pencils. Let me be honest, I don't think a pencil type eyeliner like this worth the RM39.90 price tag (or RM46, as they have increased the price recently) but for 2, I would give it a go. 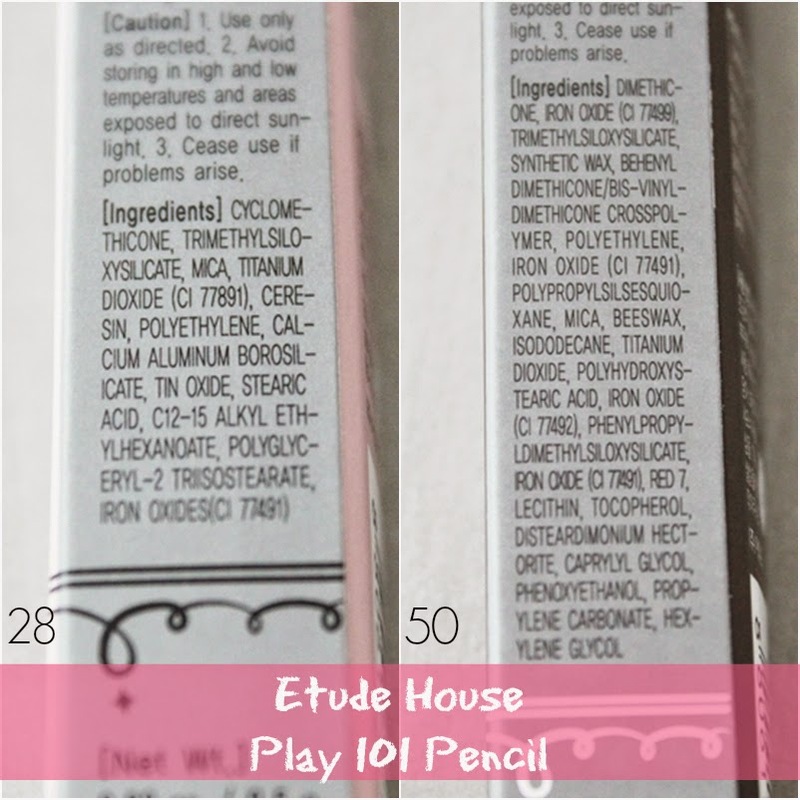 Last year in June, Etude House released a range of 50 multi-functional pencil of various colour and texture. They can be used for various purposed such as eyeliner, eyebrow, eyeshadow, lip liner, blusher, concealer and so on. Towards the end of 2014, Etude added another 10 new pencils making it altogether 60 colours in the line. A lot, right? I wonder if they are going to release more because after all, this entire pencil line is already being called as 'Play 101'. Well then, are these really worth the buy? Here is my review in detail. A plastic dark grey, 15cm long wind up tube. Although the pencil itself is retractable, it still has a little detachable sharpener at the bottom to make the tip pointy but in my opinion, it's pretty useless. It doesn't do the job well and I end up wasting the product. Etude House conveniently makes the sharpener colour coded and that should give you and idea of the actual colour of the pencil without having to open the lid. By the ingredient itself, you can already tell number #50 is more waxy than #28. 5) Glitter - Glittering texture for dramatic and fancy makeup. My suggestion is to know what kind of purpose you'd want for your pencil. 60 colours are too much and overwhelming! I wanted a dark coloured pencil as an eyeliner and also a lighter colour to brighten up my inner tightline. 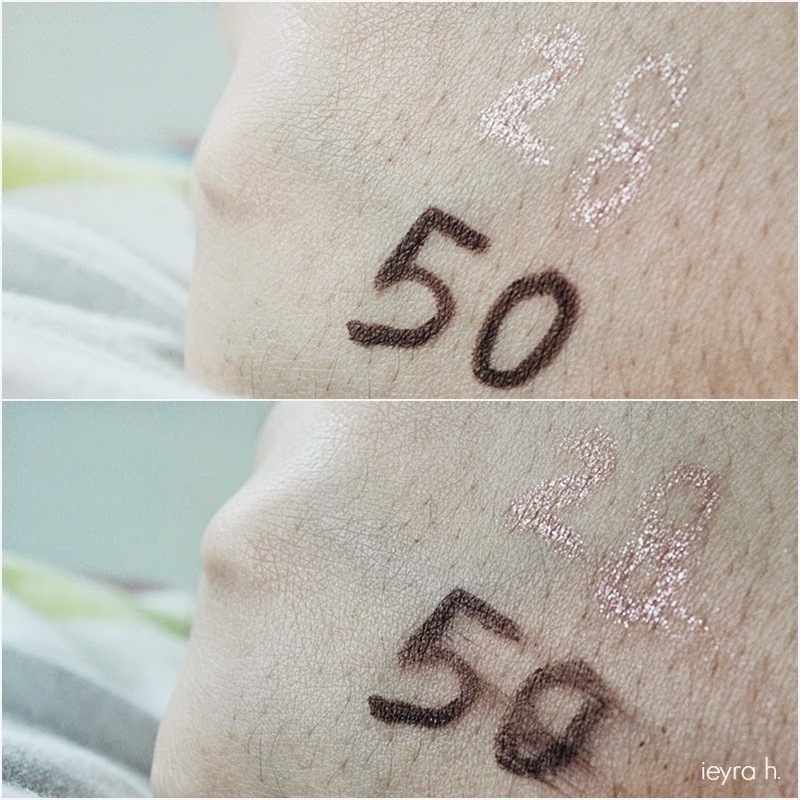 #28 has a glitter finish whilst #50 is a matte. Both glides so well on swatches as well as for tightlining the eyes. The pencils' lids are both sturdy and doesn't break easily despite their smooth and creamy texture. Even the glitter finished is creamy and I believe so does the rest of the pencils in this collection. The picture might be misleading and doesn't do justice at how the colour really stays in place but do take note that the picture below is what happened after I scrubbed the area very HARD for several times using my thumb. As you can see, #50 smudged a bit due to it's creaminess, while #28 smudged lesser. #28 is a very glittery peachy colour which I later regretted it for buying and I'm like, why wouldn't I go for a matte peachy colour?. Since it's so glittery, I find it unsuitable to apply along my waterline. I only use this as a highlight to my inner corner of the eyes if I feel like rocking some glam or aegyo looks, LOL. On the other hand, I'm very happy with my #50. It's a matte, dark brown coloured pencil. I do have sensitive eyes where I get teary eyes extremely easy when tightlining my eyes but with this, it doesn't. Holy moly pepperoni it doesn't. ;o I believe some of you are aware on the trend of tightlining your upper waterlines to give the illusion of bigger eyes and I'm so glad that I finally able to do that. What can I say.. 101 pencil in #50 is such a life changing product. Although it feels creamy upon application, it doesn't severely smudged easily, so for me Etude Play 101 in matte and glitter formulations can be difficult to blend once it dries. Keep in mind that glitter shade is more tacky than a matte shade. For an eyeshadow, glitter pencil could look patchy so you need to smooth it out and I'd suggest using a stiffer-bristled shadow brush. If you have an oily eyelid, Play 101 Pencil wouldn't last on you that long, so primer underneath would be necessary. As a pencil eyeliner, it does stay in place throughout the whole day. I've tried several pencil and twistable eyeliners from other drugstore brands such as Maybelline, NYX, Rimmel, Silkygirl and Wet n Wild, I'd say Etude House Play 101 Pencil has the longest staying power. Removing can be quite tricky for #50, it takes an oil based makeup remover and some rubbing before it goes off completely. I've never tried this brand before, but I love how they have so many colors to chose from! <3 so pretty. Wow, sooooo many colors to chose on..
Beli satu je mampu kot, naik harga la pulak ada gst ni.. hehe..
are these waterproof? I want to get some pf the matte and shimmery ones but I keep holding myself back because most of korean products aren't waterproof. I'm eyeing this one in black to use for my waterline as well, well, anything that works as an eyeliner in general is ok. I have oily and sensitive eyelids, most of the time I tend to stay away from pencil eyeliners because I'd always have to drag them really hard on my lids for the color to show up but in the end the payoff is never satisfying, maybe I just haven't found the right one? Do you have any suggestion for a creamy but smudgeproof / waterproof eyeliner?